If only life was as straight forward as trying to get your tractor to start. With the tractor, there are just a few primary things you need: fuel, air and spark. If you have these in adequate supply, you move to a secondary line of thinking, “How’s the timing and fuel mixture?” With enough time and effort (and parts), you will get your tractor started. Living a life well, is much more complex. There are so many variables, most falling into the gray areas, and few seem black and white. Growing garlic (or any crop) is somewhere in the middle. If you plant your seeds properly, conditions are right and you weed it on a semi-regular basis, chances are, you will grow a nice product. Of course, as every farmer (and home gardener) knows, it doesn’t always work out so well – because so many of those variables (weather, bugs, disease) are difficult to control. Each growing season seems to work out better for some crops than for others. Your neighbor the next town over may have beautiful onions, while yours shriveled up in early August from some kind of spotty wilt. As much as we try to control all the variables, many (or most?) are out of our complete control. So one year you have onions, the next, you don’t. This got me thinking about all the variables we deal with in our every day lives. There are the big things: our physical health, our emotions, our surroundings, how we interact with others ­– all somewhat controllable. Then there is the economy, the weather, the way other people treat us and others –things over which we have very little control. But, whether you are starting a tractor, or growing nice garlic, or trying to “live a good life,” it all seems to come down to attitude, equanimity and accepting outcomes. If we could maintain an even keel, to see the good things as good but not expect good and to see the bad things as bad, but not expect bad, then we could live a balanced life, and hopefully, also get the tractor started. 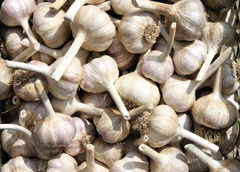 This entry was posted in From the Publisher and tagged editorial, garlic by N-News. Bookmark the permalink.